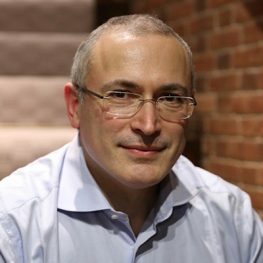 Mikhail Khodorkovsky received the "Knight of Freedom" for the uncompromising efforts to build the rule of law, civil society and the promotion of European values in Russian society. Russian oppositionist, former head and shareholder of the Yukos oil company. In 2001 he founded Open Russia Foundation, working for the spread of democracy and the idea of civil society and cultural development and international cooperation in the Russian Federation. In 2003 he was arrested on charges of avoiding the payment of taxes and irregularities in the privatization of enterprises, which was widely regarded as the Kremlin’s political revenge. In May of 2005 Moscow court sentenced Khodorkovsky to nine years’ imprisonment and a serving of a sentence in a penal colony. A few months later, the Moscow City Court reduced the sentence to eight years. In December of 2013 he was pardoned by Russian President Vladimir Putin. On the same day he left Russia.